Colombia is well known for its emeralds, coffee, and biodiversity, but should also be known for its powerful music. Colombian music is a clear example of the cultural diversity of the country; it contains numerous statements that clearly identify each region of the country, although it is very common to find several musical styles within a single region, mainly due to the different factors influencing the culture. Among the main rhythms of Colombia standout Vallenato, Cumbia, Son Sabanero, Gaita (rhythm derived from Cumbia), El patacoré, Joropo, Bambuco, Torbellino and El currulao. In order to understand the musical development of Colombia, it is necessary to take into account the social conditions in which it has been formed from three cultures: the Amerindians, the Africans, and the Spanish. Every one of these cultures had their own dances, musical instruments, and religion. Out of this mixture emerged the musical array that expands through every region of Colombia, from Vallenato songs to the music of the Llanos Orientales (the eastern plains). I have always enjoyed the sounds of Vallenatos because they are an essential to Colombian culture and it is one of the most distinctive features of the Colombian history. 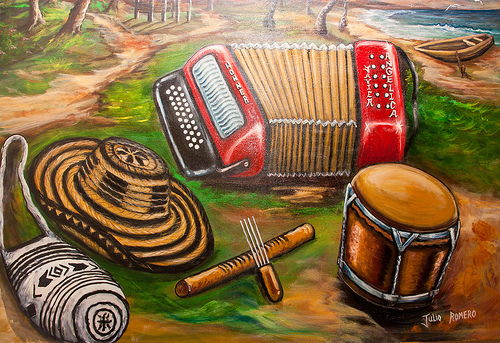 The origins of Vallenatos come from pastoral areas of Valledupar, where the “caja vallenata” and the guacharaca joined to form the basis for musical narratives about the hardships and aspirations of peasants. It is no wonder that for Colombians, Vallenatos are more than just music, it’s a way of being, a way of life and the essence of its people. Thank you! You could use YouTube link to share it. Cheers!